While we did a lot of shopping at the local grocery store, we shopped for much of our produce and meat in the more traditional way. My mom, two brothers, and I would often head out to the "wet market" (outdoor vegetable and meat market/food court that's found in each neighborhood around the country) right after Dad left for work. The early part of the day was the best time to go because it was cool, the shops were just opening, and the meat market had the best/most fresh selection. Dragging the rolling shopping buggy, we'd trek the 2km or so to the nearby wet market. Mom would send us to various shops to buy many of our family's food staples. My brothers would usually go to the meat stalls and buy our ground meat, mom would pick over the vegetables and fruits and often buy something we'd never seen/heard of/tasted before, and I would go to the "egg lady" where I'd pay for 10 eggs (selling eggs by the dozen is a Western thing. Here in Nigeria we sell them in quantities of 15 or 30 (full- or half-crate)) and usually end up getting an additional egg for free. 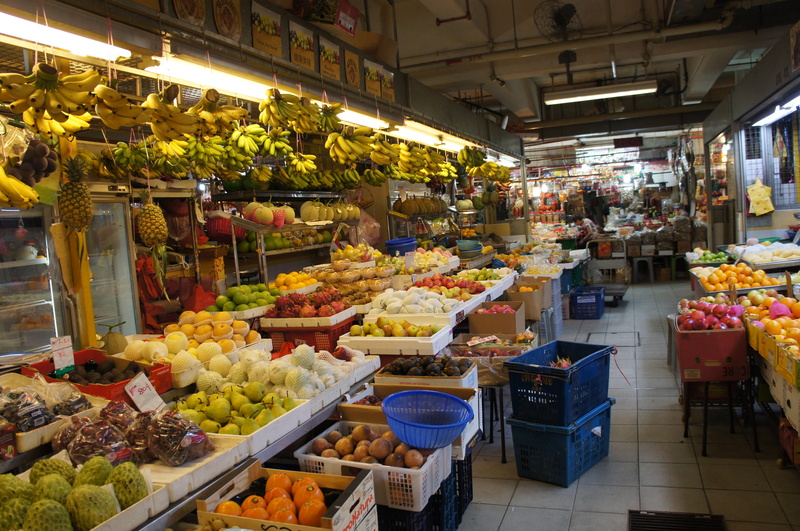 The hawker center part of the Bedok wet market we went to in Singapore. After our shopping, we'd meet back at one of the tables in the "hawker center" (food court), pack our bags into the shopping buggy, and Mom would give us money to go and buy our breakfast. Usually I'd settle with hot Milo (an instant powdered malted drink that's like hot chocolate) and "dough sticks" that were fried in a wok of super hot oil. After breakfast, we'd walk back home and then start our homeschool day. That day, my mom decided to cook chicken. 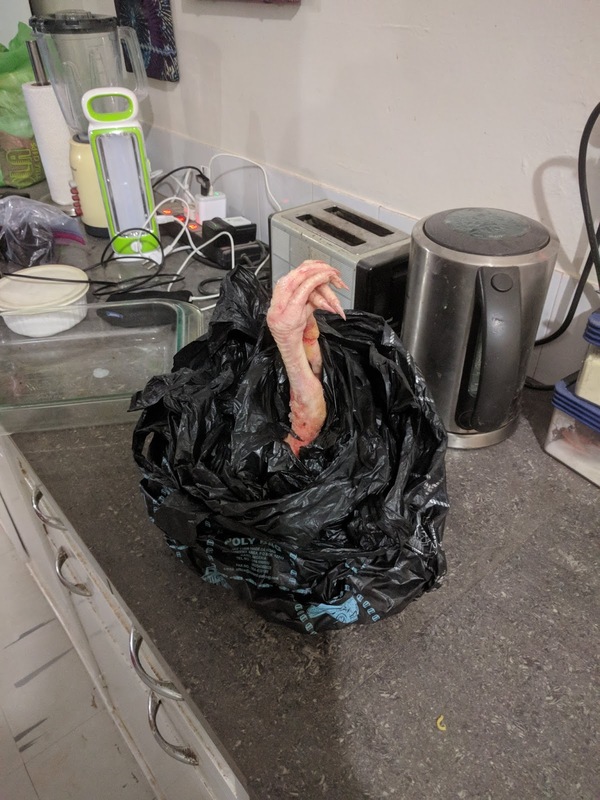 I don't know if she was planning on roasting it whole or boiling and shredding it for use in many future meals (we didn't eat much meat in Singapore), but for whatever reason she decided to buy a chicken. A whole chicken. At the wet market. Somehow, she got up the courage to chop its head and feet off and proceed with dinner preparations. And she never forgot to tell the meat seller to remove those parts before bagging her chicken. "When are you coming to pick up your chicken?" "Yes, your Christmas chicken. Everyone else has already picked theirs. Only yours is remaining and I'm still feeding it." "Oh, I see. You raised an extra chicken for me. I didn't know that. Sorry! How much is it?" "Well it depends. Do you want the one for 3,000N or the one for 4,000N?" "I'll take the smaller one since it's only me at my house." "OK. I will bring it to you because my house is a bit far. Do you want me to dress it?" I showed up to work the next day, the last day before I was to start Christmas break, Ladi handed me a black plastic bag, and said, "Here is your Christmas chicken!" She said that her niece had killed it and plucked the feathers just an hour or so ago. A fact I confirmed by the fact that the bag felt room temperature! I wasn't going to head straight home, so I had to find a way to deal with it. Ladi offered to put it in the fridge in the operating room (supposed to be used only for medications), but thankfully one of my missionary colleagues offered to take it back to our compound and put it in her freezer. So I handed her this big bag and away she went in the keke, holding it in her lap. My freezer and fridge were stuffed with food as I'd been preparing for a visitor over Christmas break and my house helper would take a two-week holiday during that time. So the chicken sat in my friend's freezer, tucked in its black plastic bag. And then the day came that I was going to make an oven-roasted BBQ chicken. I even had Kraft brand BBQ sauce I snagged on clearance a few months ago from the one grocery store in town (I don't think BBQ sauce is a fast-mover in any Nigerian grocery store!). I was so excited! it still had its neck and feet! Ok, the head was gone, but the rest of the chicken was quite intact! I *might* have squealed a little! After some sawing with my less-than-sharp chef knife, the feet and neck were tossed in my food scraps bin and I proceeded with dinner preparations. But seriously, I should have learned from my mother.... When purchasing a whole chicken in any country outside the US, there is a very high probability that it will still have its head, neck, feet, tail, or all of the above still attached. Yes, the chicken was yummy. Yes, I invited my neighbors over for a potluck meal. Yes, it was worth it. Yes, I learned my lesson! And that, my friends, is the story of my first Christmas chicken!